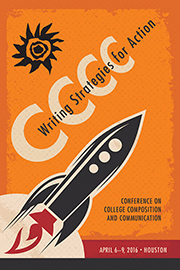 CCCC 2016 included four “keynote workshops” for writing faculty to develop strategies for action. Each workshop was offered several times during the convention, providing attendees multiple opportunities to attend. Workshops were created and offered by organizers to offer strategies for making make change. If you’re a writing instructor, program director, consultant, or student interested changing stories about writers or writing in smart, safe, savvy ways, these materials can help you get started.